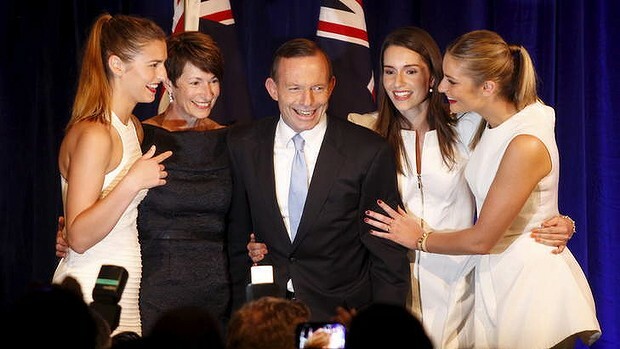 Election night success: Tony Abbott celebrates with his wife Margaret Aitken and three daughters. Australia elected a new prime minister last weekend due to a strong disciplined team led by Tony Abbott, the no-nonsense conservative leader of the Liberal party. However all leaders need a solid loyal group around them if they are to fulfil their ambitions. The cohesive team behind Team Abbott was headed by the experienced “under the radar” Brian Loughnane, his “glamazonian ” lawyer wife Peta Credlin in her role as chief of staff with pollster and strategist Mark Textor and all the supporting crew behind the scenes. All in all other than managing the personal brand image of Abbott, like picking the blue ties and making sure his public perception was controlled, they also managed the campaign in a manner that demonstrated team unity and confidence. Like in business, no leader can lead without the solid support and smarts of the supporting team behind the curtains. The incoming prime minister had what the outgoing Kevin Rudd and his Labor Party did not… Cohesive Personal Brand Leadership.